MemRabel 2 has helped thousands of people with failing memory live more independently at home and in care. With a choice of time displays to suit cognitive ability and unlimited programmable daily picture, voice, and video reminder alarms, MemRabel 2 offers peace of mind for caring family members and has a positive effect on a persons self-esteem and confidence. 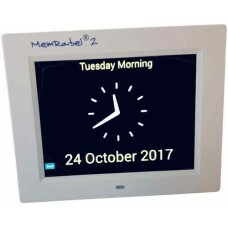 MemRabel 2 allows a family member or health visitor to set daily time reminders with voice and picture or video reminders. An unlimited number of reminders can be set for Daily, Weekly, Monthly, and Yearly playback. At alarm time the selected voice reminder with accompanying screen graphic or video is played back on the screen. Voice reminders can be set by number of repeats with the graphic set by a timed constant repeat interval from 5mins to 25mins. MemRabel 2 is supplied with pre-installed audio, picture, and video reminder files that are easily selected to create the majority of typical daily reminder requirements. Personal reminders can be created with audio (voice) and photograph, or a video which, can be added to the MemRabel library or selected as alarms from a flash drive inserted into one of the USB ports (standard or mini). Watch this short video to find out what healthcare professionals have to say about MemRabel 2. This useful recording reminder clock has many uses. Ideal as a tablet medication reminder for people..
Security - a self-locking shutter over the lid opening prevents access to the medication tray except.. The Medcenter pill storage system is designed to offer convenient, organised, storage of daily medic.. The MedCenter medication reminder prompt system comprises of a clearly marked pill dossett box and a..
Inclusive Items1. MemRabel 2 Daily Reminder Alarm Calendar. MemRabel 2 has 4 x time displays, s..
Dementia care from your SmartphoneMemRabel 2i is a simple tool to help people stay connected and a b..